You can set properties for HTML Composer with the HTML Page tab, located in the Developer Studio Options dialog box. The HTML Page tab enables you to set page properties such as the location of reports and graphs, the display of a grid in your layouts, the default form type, and setting the default caching option for the HTML page. The changes that are made in the HTML Page tab are saved to the registry. This allows a customized environment to be created for various users. For more information about the HTML Page tab, see HTML Page Tab. Select the orientation for the form object in the layout. Use the spin buttons to increase or decrease the distance between the prompt, horizontal and vertical controls of the form, and the number of columns for the form. Position the cursor in the input box and type a number. 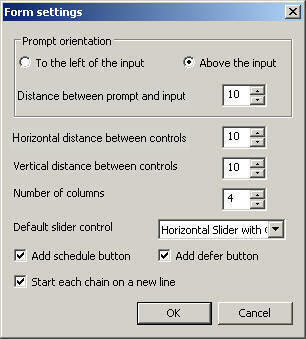 Use the slider control type options to select how the slider bar appears. Slider bars are available when using numeric range value parameters in your report or graph. Use the Add schedule button option to add a schedule button for referenced procedures with parameters if your WebFOCUS environment is licensed to use ReportCaster. For more information, see Adding ReportCaster Schedule Capability to HTML Composer. Use the Add defer button option to add a defer button for running a report deferred in the Managed Reporting environment. For more information, see Running a Managed Reporting Report Deferred From HTML Composer. Start each chain on a new line to create multiple chains from the New Parameters dialog box. Each set of chained parameters appears on new line of the Design tab, regardless of the grouping option selected from the New Parameters dialog box. Start each chain on a new line is selected by default. For example, the following image shows the default behavior where the first chain (Product Category and Product Type) is shown on one line and the second chain (Product Number, Plant, Year) start on a new line. This enables you to see the relationship of the chains within the form. Click OK to close the Form Settings dialog box. The form settings are applied and shown in the HTML Composer Design view. 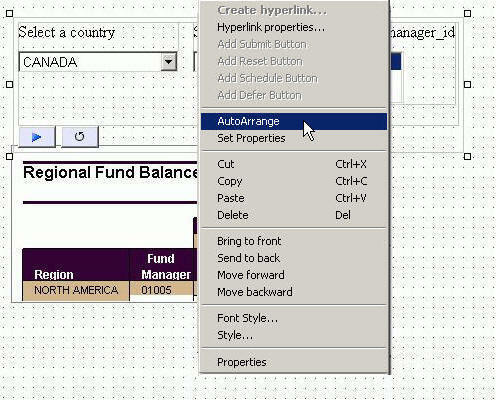 To reset the default form settings, right-click the form object and select AutoArrange from the context menu. Note: The AutoArrange option is only available when using a multiple layer form type. The form is auto arranged on the layout, using the default form settings. The following options are available from the HTML Page tab, located in the Developer Studio Options dialog box. If unchecked, icons are used to represent the area in the Design view for reports and graphs. This is the fastest method of loading reports since no request are made to the server. Selecting to preview simulated data sends a request to the reporting server that gathers formatting information from the Master File. The database is not accessed, but rather mock data is used to visually represent the report. This option is only available when previewing reports and graphs. Selecting to preview live data sends a request to the reporting server, and to the database, to get a snapshot of the actual data in the report. Enables you to limit the number of records used to gather data for previewing the report in live data mode. For example, if you set 500 as the record limit for the report, then 500 rows of data are gathered for the report results. This option is only available if the Live Data option is selected. 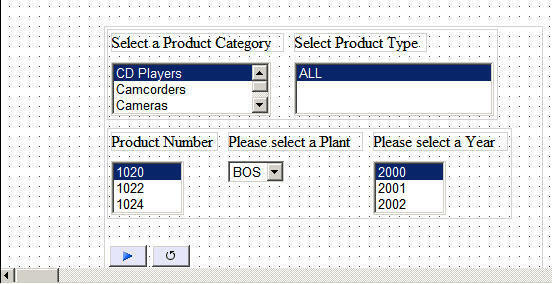 Sets the number or records to be shown for the input controls when gathering data for reports and graphs. Sets the default form type in the parameter grouping options of the New Parameters dialog box. Form types are None, Single layer, or Multiple layer. When None is selected, the parameter grouping option shows Do not create a form on the New Parameters dialog box. When Single layer is selected, the parameter grouping option shows New single layer form on the New Parameters dialog box. The single layer form contains all of the elements within a single group box. Single layer is the default form type. When Multiple layer is selected, the parameter grouping option shows New multiple layer form on the New Parameters dialog box. The multiple layer form contains group boxes around each element in the form. You may move and resize each element of the control. You may override the set form type on the HTML Page tab from the Parameter grouping options drop-down list of the New Parameters dialog box. For details, see Automatically Creating Controls From the New Parameters Dialog Box. Options are available so that you may customize how the forms are populated and arranged in the document. For details, see Form Settings Dialog Box. Controls whether or not the New Parameters dialog box shows when adding parameters in HTML Composer. The New Parameters dialog box is shown by default. Controls whether or not the Template selector dialog box shows when a new HTML page is created using HTML Composer. Controls whether to add an unlock icon to the toolbar when a template is in use. Controls whether cache run time data is on or off for the HTML page. The default is off. When adding dynamic parameters to the HTML page, input controls retrieve data using procedures. You may cache the run time data for input controls by using the cache run time option on the Properties and settings dialog box in the Parameters tab. This setting overrides the Default caching option from the HTML Page tab. For more information about the Parameters tab, see Creating a Dynamic List of Values. Automatically arranges the objects on the Parameters tab so that they take the least amount of space without overlapping each other. Auto Arrange is on by default. If this option is turned off, you may auto arrange objects directly from the Parameters tab. Right-click anywhere on the Parameters tab and select AutoArrange from the context menu. Automatically refreshes the content on the Thumbnail tab of the Properties window, every 20 seconds by default. You may change the time interval of the automatic refresh. You can set the default theme for a new HTML page. The Information Builders theme is chosen by default. The following is the list of themes that you can use. The following options are available from the Form settings dialog box of HTML Composer. Prompt refers to the descriptive text used to label the control/parameter in the output. Places the descriptive text used to label the control/parameter to the left of the input. Places the descriptive text used to label the control/parameter above the input. Sets the distance between the prompt and input. Sets the horizontal distance between controls. Sets the vertical distance between controls. Determines when the form will wrap and start laying controls out in a new row. Slider controls are available when using numeric range value parameters in your report or graph. Horizontal or Vertical Slider Simple bar. The slider bar has no end arrows, just a bar with the slider. Horizontal or Vertical Slider with Color Bar and Arrows. Arrows appear at each end of the slider bar. Horizontal or Vertical Slider with Color Bar, Arrows, and Edit. Arrows and an edit box appear at the end of the slider bar, showing the current value. Once a slider control is inserted into HTML Composer, changing these options will not affect the existing sliders. The option is only applied to new slider controls. To change the existing slider bar type, delete the slider object and insert a new slider control. Automatically adds a schedule button for referenced procedures with parameters. This option is selected by default. For more information about adding schedule capability to HTML Composer forms, see Adding ReportCaster Schedule Capability to HTML Composer. Automatically adds a defer button for referenced procedures with parameters. This option is selected by default. For more information running reports deferred, see Running a Managed Reporting Report Deferred From HTML Composer. When creating multiple chains from the New Parameters dialog box, each set of chained parameters appears on new line of the Design tab, regardless of the grouping option selected from the New Parameters dialog box.